The largest Russian earthquakes (≥ 8.0 M) since the 1950s. Earthquakes in Russia have occasionally been damaging and deadly. Some of the largest Russian earthquakes since the latter half of the 20th century are the 1952 and 1959 earthquakes in the Kamchatka Peninsula, and the 1958/1963 and 2006/2007 earthquakes in the Kuril Islands, all of which were ≥ 8.0 M. See also the Kuril–Kamchatka Trench. Note: The inclusion criteria for adding events are based on WikiProject Earthquakes' notability guideline that was developed for stand alone articles. The principles described also apply to lists. In summary, only damaging, injurious, or deadly events should be recorded. ^ USGS. "M 6.3 - Lake Baykal region, Russia". United States Geological Survey. ^ USGS. "M 6.2 - Tatar Strait, Russia". United States Geological Survey. ^ "M 8.3 - Kuril Islands". United States Geological Survey. Retrieved March 12, 2018. The Kuril–Kamchatka Trench or Kuril Trench is an oceanic trench in the northwest Pacific Ocean. It lies off the southeast coast of Kamchatka and parallels the Kuril Island chain to meet the Japan Trench east of Hokkaido. It extends from a triple junction with the Ulakhan Fault and the Aleutian Trench near the Commander Islands, Russia, in the northeast, to the intersection with the Japan Trench in the southwest. 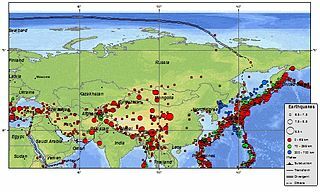 Three earthquakes, which occurred off the coast of Kamchatka Peninsula in far eastern Russia and the Soviet Union in 1737, 1923 and 1952, were megathrust earthquakes and caused tsunamis. They occurred where the Pacific Plate subducts under the Okhotsk Plate at the Kuril-Kamchatka Trench. The depth of the trench at the point of the earthquakes is 7,000–7,500 m. Northern Kamchatka lies at the western end of the Bering fault, between the Pacific Plate and North American Plate, or the Bering plate There are many more earthquakes and tsunamis originating from Kamchatka, of which the most recent was the 1997 Kamchatka earthquake and tsunami originating near the Kronotsky Peninsula. The 2006 Kamchatka earthquakes began on April 21, 2006 at 12:25 PM local time with the occurrence of a very large reverse fault event. This shock had a moment magnitude of 7.6 and a maximum Mercalli intensity of X (Extreme). The hypocenter was located near the coast of Koryak Autonomous Okrug at an estimated depth of 22 km, as reported by the International Seismological Centre. This event caused damage in three villages and was followed by a number of large aftershocks. Several M6.6 earthquakes struck on April 29 at 16:58 UTC and again on May 22 at 11:12 UTC. These earthquakes caused no deaths; however, 40 people were reported injured. The 2006 Kuril Islands earthquake occurred on November 15 at 8:14:16 pm JST with a Mw magnitude of 8.3 and a maximum Mercalli intensity of IV (Light). This megathrust earthquake was the largest event in the central Kuril Islands since 1915 and generated a small tsunami that affected the northern Japanese coast. The tsunami crossed the Pacific Ocean and damaged the harbor at Crescent City, California. Post-tsunami surveys indicate that the local tsunami in the central Kuril Islands reached runup of 15 metres (49 ft) or more. The 2007 Kuril Islands earthquake occurred east of the Kuril Islands on 13 January at 1:23 p.m. (JST). The shock had a moment magnitude of 8.1 and a maximum Mercalli intensity of VI (Strong). A non-destructive tsunami was generated, with maximum wave amplitudes of 0.32 meters. The earthquake is considered a doublet of the 8.3 magnitude 2006 Kuril Islands earthquake which occurred the previous November approximately 95 km to the southeast. 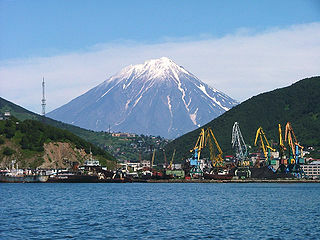 The 1952 Severo-Kurilsk earthquake struck off the coast of the Kamchatka Peninsula. The 9.0 Mw earthquake triggered a major tsunami that hit Severo-Kurilsk, Kuril Islands, Sakhalin Oblast, Russian SFSR, USSR, on 5 November 1952 at about 5 a.m. This led to the destruction of many settlements in Sakhalin Oblast and Kamchatka Oblast, while the main impact struck the town of Severo-Kurilsk. It was the fifth most powerful earthquake on record, and to date, the most powerful earthquake in Russian history. This is a list of earthquakes in 1915. Only magnitude 6.0 or greater earthquakes appear on the list. Lower magnitude events are included if they have caused death, injury or damage. Events which occurred in remote areas will be excluded from the list as they wouldn't have generated significant media interest. All dates are listed according to UTC time. In January a major earthquake struck Italy causing 30,000 deaths. There were also many earthquakes in Japan and the Kuril Islands during this year. This is a list of earthquakes in 1922. Only magnitude 6.0 or greater earthquakes appear on the list. Lower magnitude events are included if they have caused death, injury or damage. Events which occurred in remote areas will be excluded from the list as they wouldn't have generated significant media interest. All dates are listed according to UTC time. The dominant event of the year both in terms of magnitude and death toll was in Chile. In November a magnitude 8.5 earthquake struck the Atacama Region. This was one of the largest events of the 20th Century. In spite of the magnitude only 700 deaths were caused. Peru, Russia and Taiwan had several magnitude 7.0+ events. This is a list of earthquakes in 1923. Only magnitude 6.0 or greater earthquakes appear on the list. Lower magnitude events are included if they have caused death, injury or damage. Events which occurred in remote areas will be excluded from the list as they wouldn't have generated significant media interest. All dates are listed according to UTC time. 1923 was a memorable year. Among the events was the great Tokyo, Japan earthquake. Other destructive earthquakes struck China, Iran, Colombia and Russia. The Kamchatka Peninsula, Russia and Japan saw very much activity this year. This is a list of earthquakes in 1952. Only magnitude 6.0 or greater earthquakes appear on the list. Lower magnitude events are included if they have caused death, injury or damage. Events which occurred in remote areas will be excluded from the list as they wouldn't have generated significant media interest. All dates are listed according to UTC time. Two events dominated 1952 in seismic terms. Firstly in March a magnitude 8.1 earthquake struck Japan resulting in a robust aftershock sequence. Then in November, a magnitude 9.0 earthquake rocked the Kamchatka area of Russia. This event was the largest and deadliest of the year. The Kamchatka quake was not only the largest of 1952, but also one of the largest of all time. This is a list of earthquakes in 1953. Only magnitude 6.0 or greater earthquakes appear on the list. Lower magnitude events are included if they have caused death, injury or damage. Events which occurred in remote areas will be excluded from the list as they wouldn't have generated significant media interest. All dates are listed according to UTC time. This was a fairly active year. There were no great quakes above magnitude 8.0+ as experienced in previous years. Magnitude 7.0+ quakes numbered 12 in all. Japan led the way in magnitude terms. Other large quakes struck Chile, New Zealand, Papua New Guinea and Turkey. The quakes with the most human casualties were in Turkey, Iran and Greece with the vast majority of the death toll coming from these events. This is a list of earthquakes in 1954. Only magnitude 6.0 or greater earthquakes appear on the list. Lower magnitude events are included if they have caused death, injury or damage. Events which occurred in remote areas will be excluded from the list as they wouldn't have generated significant media interest. All dates are listed according to UTC time. The year was characterized by a lack of large of events. The largest event of magnitude 7.8 occurred in Spain, albeit a rare event for the area, there were no deaths due to its depth. A significant quake struck Nevada in December. With a magnitude of 7.1, this was one of the largest in the state's history. Total lives lost in the year amounted to 1,294. The vast majority of these came from Algeria, which suffered one of its worst disasters in September. This is a list of earthquakes in 1958. Only magnitude 6.0 or greater earthquakes appear on the list. Lower magnitude events are included if they have caused death, injury or damage. Events which occurred in remote areas will be excluded from the list as they wouldn't have generated significant media interest. All dates are listed according to UTC time. Not the most active year with only 8 earthquakes reaching above magnitude 7.0. The largest event was a magnitude 8.3 earthquake in Russia in November. Alaska, Ecuador and Peru saw fairly high activity. 1958 had only 368 deaths. Most of this total came from earthquakes in Iran and Ecuador. This is a list of earthquakes in 1959. Only magnitude 6.0 or greater earthquakes appear on the list. Lower magnitude events are included if they have caused death, injury or damage. Events which occurred in remote areas will be excluded from the list as they wouldn't have generated significant media interest. All dates are listed according to UTC time. Generally the year experienced below normal seismic activity with 10 magnitude 7.0+ events. The largest was a magnitude 7.9 which struck Russia in May. August was an interesting month mainly owing to a magnitude 7.2 earthquake which struck Yellowstone National Park. This resulted in 28 of the 94 deaths during 1959. Most of the deaths in fact were in August as Taiwan and Mexico were struck by events which caused 16 and 25 deaths respectively. This is a list of earthquakes in 1963. Only magnitude 6.0 or greater earthquakes appear on the list. Lower magnitude events are included if they have caused death, injury or damage. Events which occurred in remote areas will be excluded from the list as they wouldn't have generated significant media interest. All dates are listed according to UTC time. Maximum intensities are indicated on the Mercalli intensity scale and are sourced from United States Geological Survey (USGS) ShakeMap data. A fairly active year with 17 events reaching above magnitude 7.0. The intensity of the events was stronger with 2 measuring above magnitude 8. Both events came within 3 weeks of each other. The strongest of 1963 was in the Kuril Islands, Russia and was magnitude 8.5. Macedonia had by far the most of the 1,488 fatalities. A fairly modest magnitude 6.0 event in July resulted in 1,070 deaths and substantial destruction. Libya had one of the worst events in its history in February. Again a fairly moderate magnitude 5.6 ended up with 300 deaths in the area. This is a list of earthquakes in 1968. Only magnitude 6.0 or greater earthquakes appear on the list. Lower magnitude events are included if they have caused death, injury or damage. Events which occurred in remote areas will be excluded from the list as they wouldn't have generated significant media interest. All dates are listed according to UTC time. Maximum intensities are indicated on the Mercalli intensity scale and are sourced from United States Geological Survey (USGS) ShakeMap data. There was a large resurgence in activity in 1968. 22 magnitude 7.0+ earthquakes struck various parts of the planet. The largest of these was a magnitude 8.2 event in Japan in May. Large aftershocks struck the area following the mainshock. New Zealand and Indonesia had some upheaval during the year. The high activity contributed to over 12,000 deaths across the world. The vast majority of this total was caused by a destructive event in Iran in August with nearly 10,500 deaths. Events in the Philippines, Italy and Indonesia also had significant fatalities. This is a list of earthquakes in 1969. Only magnitude 6.0 or greater earthquakes appear on the list. Lower magnitude events are included if they have caused death, injury or damage. Events which occurred in remote areas will be excluded from the list as they wouldn't have generated significant media interest. All dates are listed according to UTC time. Maximum intensities are indicated on the Mercalli intensity scale and are sourced from United States Geological Survey (USGS) ShakeMap data. Activity generally was slightly below average with 14 events reaching magnitude 7 or greater. The largest event was off the coast of Portugal in February and measured 7.8. Other parts experiencing large events were Indonesia and Russia. The Americas had no events above magnitude 7 which is an uncommon occurrence. Of the 4,000 deaths from earthquakes two events dominated. Southeastern China had an earthquake of magnitude 5.7 in July which contributed 3,000 of the total. Indonesia had the bulk of the rest of the death toll. This is a list of earthquakes in 1973. Only magnitude 6.0 or greater earthquakes appear on the list. Lower magnitude events are included if they have caused death, injury or damage. Events which occurred in remote areas will be excluded from the list as they wouldn't have generated significant media interest. All dates are listed according to UTC time. Maximum intensities are indicated on the Mercalli intensity scale and are sourced from United States Geological Survey (USGS) ShakeMap data. Both the number of large events and the death toll were substantially lower in 1973. There was 9 magnitude 7.0+ events. The largest of these was in Japan measuring 7.7. Russia and Vanuatu were active during the year with each country having 2 magnitude 7.0+ events. Of the 700 deaths during the year Mexico had the vast majority over 2 separate events. One deadly earthquake struck in January and the other in August. The latter contributing 600 deaths to the overall total.